Many physicians view dictation as a fundamental component of everyday operations. 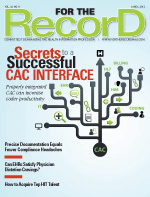 Can EHRs compensate for this long-held attraction? Earlier this year, Florida-based radiation oncologist Paul Schilling, MD, chose to retire from his profession at the age of 50. He told The Gainesville Sun that his decision to hang up his stethoscope at a relatively young age was based in part on his practice’s decision to move from paper records to an EHR. Schilling, who preferred to document care by dictating his notes and having them transcribed, claimed the technology slowed his work pace. Schilling isn’t alone in his preference for dictation. In fact, the Medical Records Institute reported that in 2008, some 90% of medical documents were created via the combination of dictation and transcription. The meaningful use incentives have been a powerful lure for physician practices to scrap their old methods and join the ongoing movement toward a more electronic environment. For the most part, this trend has been widely praised throughout the industry. Widespread use of EHRs has many benefits, say proponents, and any drawbacks are easily outweighed by those gains. Still, finding a way to incorporate dictation and EHR use would seem to be an ideal solution for many physicians. “As healthcare professionals, it is our duty to assist the physicians in the most appropriate way possible. Technology is rapidly emerging, and we need our physicians to embrace it rather than thinking retirement is the best solution,” says Kengia Johnson-Sabree, RHIA, HIM operations manager at Bayfront Medical Center in St Petersburg, Florida. For many patient encounters, dictation offers opportunities for physicians to provide details that can’t be captured in EHRs, which use discrete, or structured, data entry. In addition, if physicians choose to bypass discrete data entry, opting instead to enter text, the system can no longer create accurate reports based on the structured data entry fields. Jason Mitchell, MD, assistant director of the American Academy of Family Physicians’ Center for Health IT, says dictation is an excellent way for physicians to record what is on their minds regarding their patients. It allows them to capture nuances and subtleties that cannot be communicated strictly through EHR fields. While dictation affords physicians an avenue to tell patients’ stories, in some ways it can fall short when compared with an EHR. One way the healthcare industry is changing to accommodate physicians’ desire to dictate notes and more easily input data into EHRs is by employing scribes, who are typically young healthcare professionals who will document patient encounters through direct observation. As the EHR offers prompts, the scribe communicates with the physician. Because many practices have more than one physician, several scribes are usually employed. “It’s similar to the experience you have at the dentist. Just as the dentist talks to the hygienist, the physician talks to the scribe, whose role it is to document the visit,” says Mitchell, adding that scribes who have other responsibilities (ie, a nurse) may not be the most ideal candidates from a financial perspective. Certain programs allow physicians to interact with the EHR. A patient’s story can be dictated into a specified field, so there is some narrative. Facilities can also mark dictation and send it to the correct component in the EHR. Other programs enable physicians to dictate through voice-recognition software and move from one screen to another while filling in the required values. Bayfront Medical Center recently went live with a discharge medication reconciliation process that helps improve the dictation process and save time for busy physicians. The process allows the dictation software to interface with the EHR and extract discharge medications to automatically populate into the discharge summary. Johnson-Sabree says the process has helped build trust between physicians and nurses. “The nurses are responsible for typing this information into the EMR so the more accurate, the better. This reduces the amount of time spent on edits and duplication of effort,” she says. Because Bayfront Medical Center physicians sometimes dictate in odd places (eg, their cars) where they do not have specifics such as medications or dosage available to include in the dictations, the technology becomes even more valuable. “Such pertinent information should never be left out and, at times, it may take a physician several minutes to run down the list of medications. Thanks to our transcription company [Landmark], they no longer have to. It’s a win-win for all of us,” Johnson-Sabree says. Bhat says the technology will enable doctors to compare data. For example, a physician can graph vital signs over time whether the information was entered initially as voice or typed data. This capability can enhance the physician-patient experience and meet meaningful use requirements. EHR technology is a two-way process, requiring that data not only be entered but also that the system produces valuable information to help practitioners proceed both clinically and administratively. Dictation, a one-way mechanism, must conform to this functionality. He says physicians are making the process more interactive by creating a triangle with the patient and provider both viewing the computer screen. Analogous to a physician dictating while the patient is in the room, this configuration allows patients to be involved in a collaborative process that helps generate an effective treatment plan.